The Basics of Speech teaches students to be more competent communicators by helping them understand the communication process, appreciate their own communication skills, and develop greater strengths in communication. The text is based on five communication functions identified by the National Communication Association: controlling, feeling, informing, ritualizing, and imagining, and is ideal for both middle and high school. 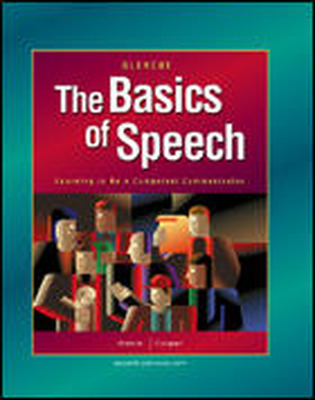 In the Program Highlights section of the Teacher's Resource Book, the authors write: "Young adolescents are concerned about building relationships with their peers, becoming more adept at socializing, formulating reasons for their actions and beliefs, evaluating the messages of others, and becoming more skilled at speaking in front of others." Young adolescents are deciding "who they are and how they fit in." The educational experiences in The Basics of Speech are designed to help students build confidence in their communication abilities as they make these decisions.